*Present address, Höhere Fachschule für Augenoptik Köln, Bayenthalgürtel 6-8, 50968 Köln, Germany. We try to improve the accuracy of eccentric photorefraction by taking more information into account than just the size and tilt of the crescent. 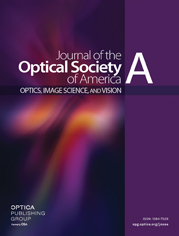 Based on Gaussian optics and the assumption of an isotropic scattering retina, a theoretical analysis of the light-intensity distribution in the pupils of astigmatic eyes is presented. The method is applied to different photorefractor setups (point light source, long linear light source, knife-edge aperture, and circular aperture). In the case of a knife-edge aperture the crescent structure can be formulated analytically. In the case of a circular aperture an analytic description is possible only for spherical refractive errors, but astigmatic refractive errors can be determined from crescent parameters with neural networks.